For a specific parabolic reflector dish and feed antenna, the gain pattern may be calculated using the handy Pattern approximation tool. 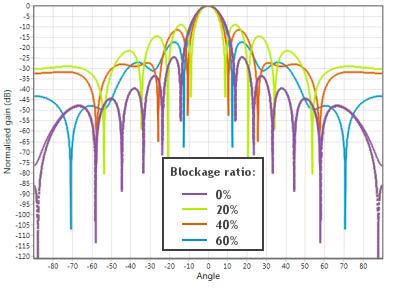 This tool allows the user to consider the theoretical gain and pattern performance of larger reflectors (which could result in long simulation times) or predict the influence of parameters like blockage ratio or feed distribution efficiency. 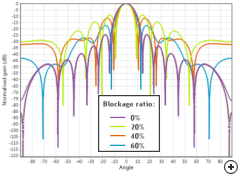 For example, the tool can be used to study the effect of blockage ratio on the pattern without having to do any simulations. The above graph was generated from that study.